You might not know her name but you’ve probably seen a video of her stripped down to a black bikini in an outdoor market and having people drawl a heart on her body – The Stand for Self Love or as it was first named A Stand for Self Love! Amy Pence-Brown joins us to talk about how this public performance art piece completely transformed her life (and the lives of those who witnessed it). I was delighted to connect with Amy at the Denver airport a few months ago while she was on a layover for a speaking engagement. 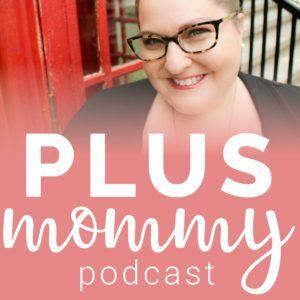 We talked all things body love and motherhood over some red wine. She’s incredibly genuine and someone who inspires me to be a better body positive activist! Now let’s hear from the lovely and multi-talented Amy Pence-Brown! If you had to do it all over again, would you change anything about The Stand for Self Love? No, not a thing. It was organic and electric and the humanity in the air that day was palpable. Everyone in the market knew something extraordinary was happening. I was so lucky I had the forethought to ask a photographer to stealthily shoot from a distance because she captured that beauty in a really thoughtful and honest way. Her images combined with my words in a blog post, and a little video we created one night using the iMovie app, touched people deep in their hearts and souls and continues to do so in substantial ways. 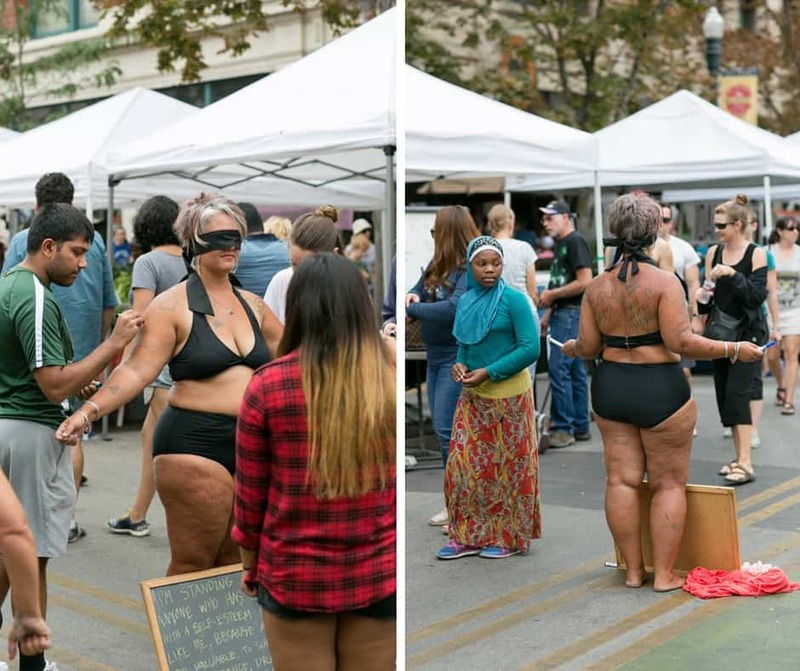 Honestly, when we dropped it all on the internet a few days later, I thought my friends in Boise would love to read about something pretty special and inspiring in the body positive revolution that had happened in response to my latest performance art piece. Never in my wildest dreams did I think it would capture international attention to the tune of mega worldwide press and 150 million video views. At the start of your recent TedTalk, The Stand for Self Love, you shared that you Googled, “Why am I fat and happy?”. Were you surprised by what you found? Seven years ago I literally Googled the words, “why am I fat and happy?” because I knew no one else who was, beside myself. I began to get discouraged as I scrolled through pages and pages of ads for diets and fitness programs and stories from women’s magazines telling me I was UNhappy because I was fat. Finally, though, I found Kath Read’s the Fat Heffalump blog and Marie Denee’s The Curvy Fashionista website and they forever changed my life, providing me with links to other articles, books, fat activists, places to find plus-sized clothing, and people who looked, and thought, like me. Even though they were hundreds of miles away from Boise, finding the body positive/fat acceptance community, as small as it was in 2009, was refreshing and exciting. You mention Brene Brown and other inspirational people during your talk. Who would you say has guided you the most and how have you been able to tune out the negative messages about body image we hear so often. I owe so much to the fat activists and feminist artists and writers who came before me (and some newer voices who continue to inspire my work). The radical words of Marilyn Wann, Linda Bacon, Marianne Kirby, Marie Southard Ospina, Elizabeth Gilbert, Audre Lorde, Naomi Wolf, Lindy West, Lesley Kinzel, Cat Pause, Charlotte Cooper, Ragen Chastain and you (Jen McLellan!) are a few. Feminist artists, both past and present, whose work I’ve been inspired by include Carolee Schneeman, Yoko Ono, the Guerrilla Girls, Rachel Cateyes, Ana Mendieta, Substantia Jones, and Stacey Bias. The list is long, important and diverse (I could go on all day!) and each have helped teach me new and interesting ways to combat this long-standing love affair America has with oppressive, body shaming consumerist culture. I don’t actually tune out the negative messages about our bodies at all – if anything these women have pushed me to listen harder and more critically and to use my words, my voice, my education, and my body to be brave and help change the conversation. These activists Amy Pence-Brown listed are incredible, and I sure encourage you to do a little Googling to connect with all of them! At the end of your TedTalk you encourage people to take their own stand for self love. What tips do you have for someone who doesn’t even know where to begin or doesn’t feel worthy of self love? It’s a lifelong journey and process, accepting and loving your body and yourself as you are, right now, because it’s constantly changing. Education has been the key to my body positivity. Read, read, and read some more. Books have always changed my life and my mind, and continue to do so. Also, start following fat fierce feminists on Facebook or Instagram. Revamp your media feed so that you’ve got more diversity and body positivity and intersectional feminist thinkers providing you food for thought daily. What’s the next stand you’ll be taking and how can we follow you on your journey? 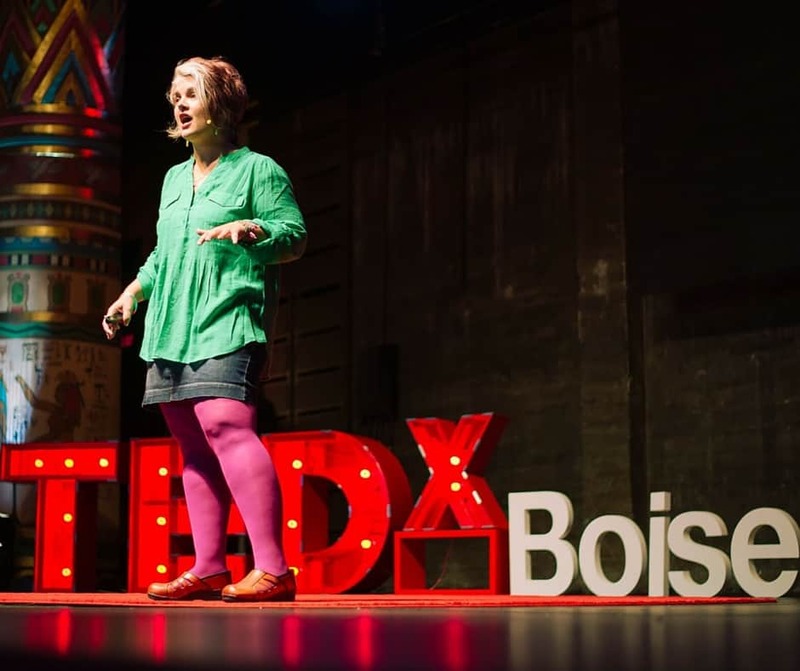 As a fat feminist mother in Idaho, I’m always opening my heart and my mouth for something I believe in, either in my art, at public speaking events or on the written page. You can follow along with all of it on my website amypencebrown.com, by following me on Facebook at Amy Pence-Brown – Writer, Artist, Body Image Activist and on Instagram. I’m super excited to be presenting virtually at two body positive conferences in the next several months, Fat Studies: Identity, Agency & Embodiment at Massey University in New Zealand in June and at the Fat Activism Conference in September. And I’m always leading the revolution daily, in small and big ways, in the community in my Facebook group, the Boise Rad Fat Collective (you don’t have to live in Idaho or be fat to join. You just have to be positive, kind, and check your privilege when posting. All ages and genders and nationalities welcome!). That social experiment was so beautiful… I forget people can be so sweet – I teared up. Wow.